Track continues the success of the Heat bowling ball line with the Track Ultra Heat. This ball is ideal for drier lane conditions and uses a stronger hybrid coverstock to offer more mid lane traction opening it up to a larger variety of lane patterns. This is all achieved with the combination of the DR-6 Hybrid coverstock and Modified Tri-Core. The Dr-6 Hybrid is considerably stronger than the coverstocks on previous balls in this line. With the 500/1000 grit polish finish this cover will produce length with a downlane motion and is ideal for medium oil conditions. The Modified Tri-Core is a nod to the original Heat core with the same RG but a lower flare potential to accommodate the modern stronger covers. THE HEAT IS ON WITH THIS BALL! AS A FAN OF THE ORIGINAL HEAT THIS BALL REALLY ADDED A DEFINITE CHANGE IN MY APPROACH TO THE GAME ESPECIALLY WHEN HOUSE SHOTS BURN UP OR TRANSITION AT A TOURNAMENT THIS BALL COMES STRAIGHT OUT OF MY BAG..WITH THE ORIGINAL HEAT I HAD TO PUT A LITTLE MORE ON THE BALL TO GET IT TO TURN THE CORNER AND DRIVE THROUGH THE PINS THIS ONE I DONT NEED TO DO ALOT OF THAT..THE COVER AND CORE REALLY HELP ME PLAY THE LANES WITH LESS DIFFICULTY..EVEN ADDING SURFACE TO THIS BALL HELPED MY BALL MOTION THROUGH THE PINS WHEN LANES ARE HITTING TRANSITION..IF YOUR A TOURNAMENT BOWLER THIS BALL NEEDS TO BE WITH YOU AT ALL TIMES CAUSE IT HANDLES THE LANES SMOOTHER AND MORE CONTROLLABLE TOWARD THE POCKET! Who Doesn't Like A Little HEAT!!! Ultra Heat - House (Box Surface and 2000) - Pin above the ring finger CG to the right. Positive Axis Point 4 3/8 right 1/2 up. 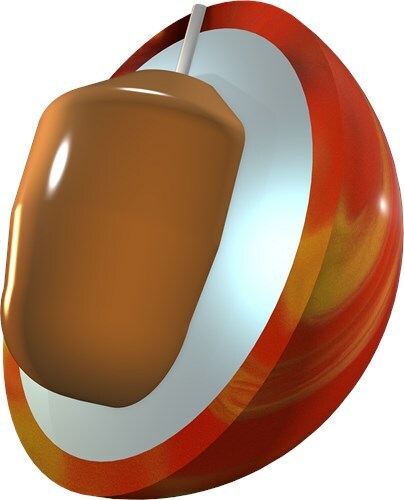 Ultra Heat is easily going to be a favorite of mine I have a hard time finding a ball that will stop hooking during that last game of league. I used the Ultra Heat all three games just to see how the shape would change throughout the night, first game it was laboring which was expected. Second and third game I could see the length work to my advantage. I played around with the surface put 2000 by hand on it not bad either I was happy to see it still wasn't to strong and not early at all. I am going to make another surface change by hand more then likely 3000/4000 which might put me close to box finish. I am looking forward to using the Ultra Heat and Kinetic Emerald combo when the lanes start to break down. If you're looking for that ball that has length and it finishes through the pins the Ultra Heat is a pleasant surprise. Pleasantly surprised of the "skid flip" motion with this one. Jumped off the spot nicely. It was controllable and didn't over react. Pin carry is great with this one too! I use mine on shorter patterns or patterns with less volume where I need it to get through the front part of the lane but still have enough to recover. A must have! The Track Ultra Heat is exactly what you would expect from the hybrid version in the Heat series. The Heat Xtreme solid coverstock is capable of rolling early and strong, while the original Heat pearl cover permits a lot of skid and backend recovery. The Ultra Heat comfortably fits right in the middle. My Ultra Heat is drilled with the pin just above and just right of my ring finger, with the CG lined up with my ring finger (PAP 4 ¾" over, 5/8" up). This is the same layout I have on my original Heat. What I was hoping for was a stronger version of the Heat - something I could expect to get down the lane but not disappoint in the backend. What I found was a very evenly measured roll in the backend - stronger continuation than the Heat - in fact, the continuation was surprisingly similar to the Heat Xtreme. 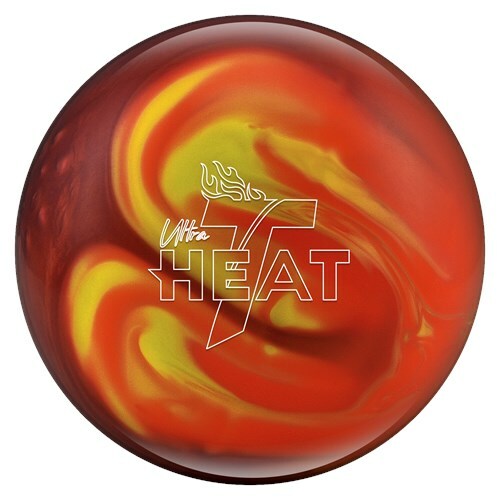 The Heat Xtreme is my ATF mid-performance Track ball, and the Ultra Heat appears to be a perfect compliment. This will most definitely be a great Game 2-3 ball on league night as well as an excellent choice for transition on medium length sport shots. The original Heats lane condition is for light-medium lane conditions whereas the Ultra Heat is for medium oil lanes only. They are both upper mid performance balls. As of right now, we offer this ball in 14, 15 and 16 pounds. Due to the time it takes to produce the Track Ultra Heat ball it will ship in immediately. We cannot ship this ball outside the United States.